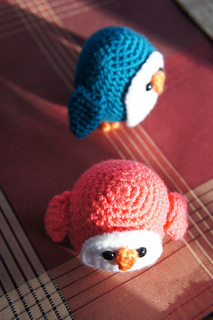 These little penguins are cute a smooshable! They’re also super easy and fun to make. 4 ply worsted weight yarn in Main colour, Beak colour, and White. The Penguin’s height is 8 cm/3 inches. This pattern is great for beginners or anyone who just likes cute stuff. There are pictures, easy to follow instructions as well as an explanation of ScDec. This pdf is 0.8 MB.